Are you tired of cockroaches or bed bugs at home and wondering what will be the rates and charges of pest control services in Chandigarh? Well, you are not alone. Common pest like bed bugs, cockroaches, termites, mosquito etc can be so unbearable at times that the only option left is to hire a local pest control company to eradicate pests. And if you are new in Chandigarh, Mohali or Panchkula, or you have never hired a pest control company in and around Chandigarh then knowing a bit about rates and charges of pest control services in Chandigarh will help you in many ways. And while we’re at it, let me tell you that the rates of pest control services in Chandigarh starts from as low as Rs. 500.00 for 1 room kitchen and it can go up to Rs. 1050.00, depending on the company that is offering the service, kind of treatment being applied and level of infestation. So there is a lot to know and understand to get maximum benefits out of pest control services in Chandigarh. Usually it’s not difficult to eradicate pest, especially when it has just started to infest. There are many do-it-yourself ways and treatments and best practices that anyone can follow to remove pests from his space. But when the normal natural disinfectants and keeping the household clean is no longer effective then it is wise to take professional help. But there are so many pest control companies out there in Chandigarh and they all have different level of quality and service standard, so naturally there charge differently. And the biggest confusion for a homeowner like you will be to pick the best possible company, just at the right price. Deciding what bill you have to pay at the end of the pest control service is a little tricky because there are many factors that go on to decide the final charges for pest control services. So, what actually happens, is most of the time when you contact the company, they visit your home, do proper investigation of the place and then they decide which plan or method is best to end the pest problem in your home. Some time just one off treatment is not enough to eradicate the pests completely and hence it may require multiple treatments, so naturally that will affect the overall costs and prices of pest control services. But, what you can actually do is to know about the standard market rates of pest control services because then you will have a general idea about how much it would cost to avail pest control services in Chandigarh. 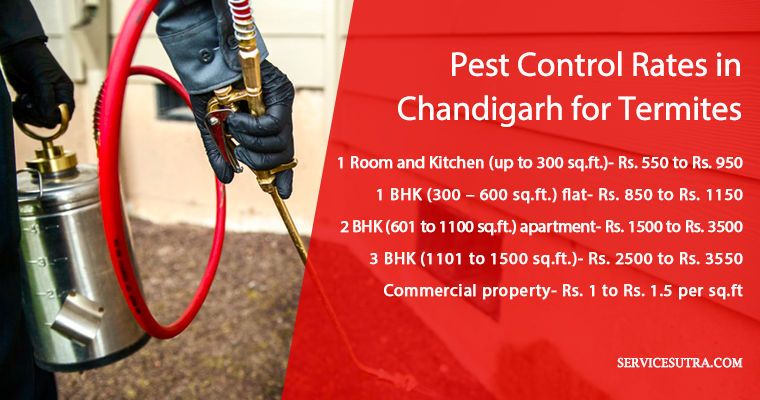 So, what I will recommend you is to do a little bit of study regarding the current market rates and charges for pest control services in Chandigarh. I have already jotted down the tentative rates for various pest control services in Chandigarh below. The primary objective of general pest control is not eradicating the pests, rather stop pest infestation. If you are getting periodic general pest control done at your home, chances are your house/office will always remain pest free. This is the best and cost effective preventive measure you can take to prevent pest infestation. While you are doing some background research on rates and charges, let me help you with standard rate chart for general pest control services in Chandigarh. Ok, so after you have done your study regarding the standard market rates for the general pest control services in Chandigarh, it is necessary that you do some study on the charges of specific pest removal like bed bugs, termites, cockroach etc. This is because, not all pests get eradicated with the same method. So, the pest control companies decide which method works best in your case and then they accordingly perform the treatment. Now, charges are therefore little different depending on the kind of pest you are trying to get rid of. However, here also no rates can be said as final until and unless the proper inspection of your home is done but I can definitely help you out with some tentative charges in case of termites, bed bugs and cockroaches. These are the most common pest issues faced by the residents of Chandigarh, so I think knowing a little about these treatments will help you in hiring service providers at right price. One of the deadliest and harmful pests commonly found in our homes is termite. Termite treatments are usually performed in multiple sessions, but depending on the square feet area, it can be done in a day or so. Termites are known to cause damages to wooden furniture and they do it very fast, and by the time you discover that there are termites, it might have caused the irreversible damage. Bed bugs as we you know may not be deadly and harmful like termites, but this tiny little creature can keep you awake all night. Bed bug bites are not considered to be very harmful in general, but its bite is enough to disturb your sleep. It’s easy to eradicate bed bugs in early stage, but once infested its quick to multiply and hard to get rid of on your own and hence you may need professional help. Listed below are the rates and charges for bed bug pest control in Chandigarh. Office or commercial space – Rs. 1 to Rs. 1.5 per sq.ft. Cockroach as you know is very unhygienic and there are many who can’t bear the sight of cockroach roaming around. It usually starts from kitchen, but it can spread all over your home in no time. Cockroaches can contaminate your food and when the infestation level reaches its highest point then cockroaches can roam freely all around your home even in broad daylight. Best way to get rid of cockroaches is to keep the surrounding clean and dry and periodically apply cockroach repellant in the affected or suspected areas. Listed below are the rates and charges for cockroach pest control in Chandigarh. Office/ commercial space – Rs. 1 to Rs. 1.5 per sq.ft. Now that you know about standard rates and charges of pest control companies in Chandigarh, I am sure you will be in a position to deal with the service provider much easily. If you are looking to hire pest control services and wondering where to go and how to get best rates offers, then should try using servicesutra. We have on boarded some of the best and leading pest control companies in Chandigarh on this platform who are competent with their rates and consistent with the quality of services and treatment. So just create a request by submitting the quote request form or call us on 07044123404 to receive no obligation free estimates from the leading pest exterminators in Chandigarh. Within 15 minutes of submitting your request, you will receive rates and offers from up to three different companies. You can even ask them to do a free survey and submit their final quotations. You can compare and choose the service provider you like the most and get it sorted. And the best part of using servicesutra is that the service providers are widely spread all over Chandigarh starting from Mohali to Panchkula to Zirakpur and nearby towns and suburbs. Wherever there are humans, pests are bound to be there. But It is due to these increasing number of pests that our living environment is turning more and more unhygienic which in turn is leading to the spread of so many diseases which were unknown to mankind in ancient times. Luckily, we, today have many pest control companies all over India who are quite updated and efficient in eradicating the problem of pests from our households and workplace. Since there are so many pest control companies operating through Chandigarh, Mohali, Panchkula and nearby suburbs that it’s going to be really confusion for you to the rightly placed company for the job. Having some general idea of the costs for various pest treatments services will definitely help you deal with them on better terms. I have already shared the prices and standard rate chart for various treatments including general pest control, cockroach removal, termites pest control etc and I seriously hope that it’ll help you. What else do you think one should know when hiring pest control services in Chandigarh that usually help?